Sunday Salon...a week of thanksgiving. This whole post shall be one where I focus on things for which I am thankful. 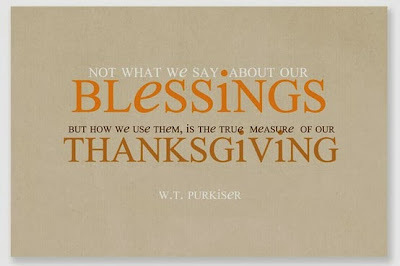 Please share a comment of something you are thankful for now in your life. I am thankful for music. Today I played a CD I bought at the library for two dollars Immortal Beloved which is the soundtrack from a movie about Beethoven. Below is one of my favorite Beethoven pieces from Symphony No. 7 in A Major, Opus 92, Movement II, Allegretto. Cue the music and play it as you read my blog. I am grateful for friends, family, and caring associates. 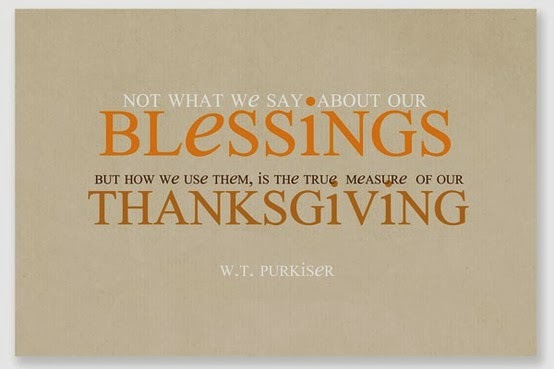 This week as we gather for a Thanksgiving meal with my parents, who are both in their mid-eighties, two of my siblings and their families, and my children, I am reminded how blessed I am. I am so thankful for people who know what they are doing with technology. We got word mid day on Friday that our library system has been restored fully and we will be back on-line with it early this coming week. We have been without a functioning OPAC system since October 16th. I am so grateful for a husband who loves and supports me. Today we weren't able to sit next to each other at church. At one point the pastor said something in his sermon which pertained to us. When I looked over at Don, he winked at me. It made my heart swoon. I am so thankful for books and for the authors who write them. I just finished Khaled Hosseini's latest book, And the Mountains Echoed. I kept thinking as I listened to this audiobook that Hosseini is a wordsmith, he puts words together so magically. Last week in church the youth pastor asked the children to come forward for a children's sermon and part of it was based on thankfulness. She asked kids to identify things they were thankful for and one kid yelled out "BOOKS." I agree. I am grateful for a sense of humor and times we can laugh together. 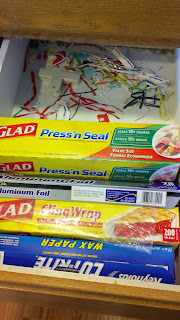 The photo below shows our "find" today when we were were looking for a twist-tie. I always save them and then can never find them. No wonder, they migrate to the back of the drawer. My husband found them when he was moving things around in the drawer. We shall never want for a twist-tie again. Ha! 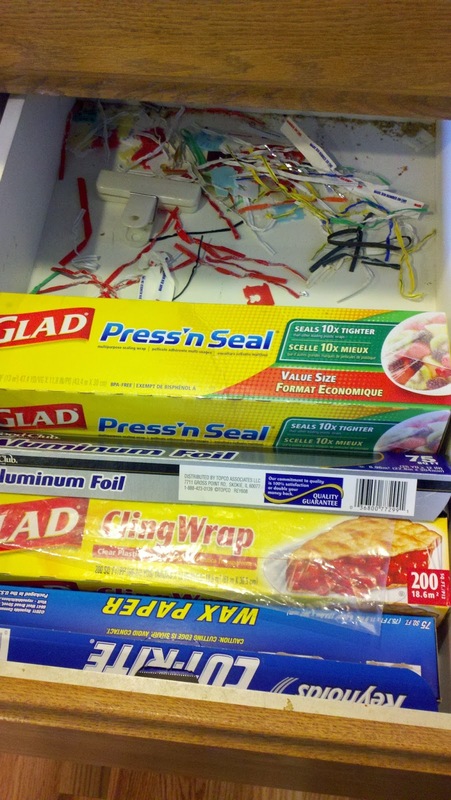 Where twist-ties go to die, our kitchen drawer. This weekend we did a lot of shopping. I'm not really grateful for shopping but I am glad that we were able to get the majority of our Christmas shopping done before Black Friday. We even bought a new artificial tree. I am very grateful for that since our old artificial tree was so big and bedraggled looking. I am grateful for my health. I ordered new glasses this week which should help me even feel grateful about my eyesight. I am thankful to God and for His loving-kindness toward mankind. I am blessed to be a child of God. I am thankful for you, dear reader of this blog. I hope that you have a blessed week. The yard to looking pretty sad. 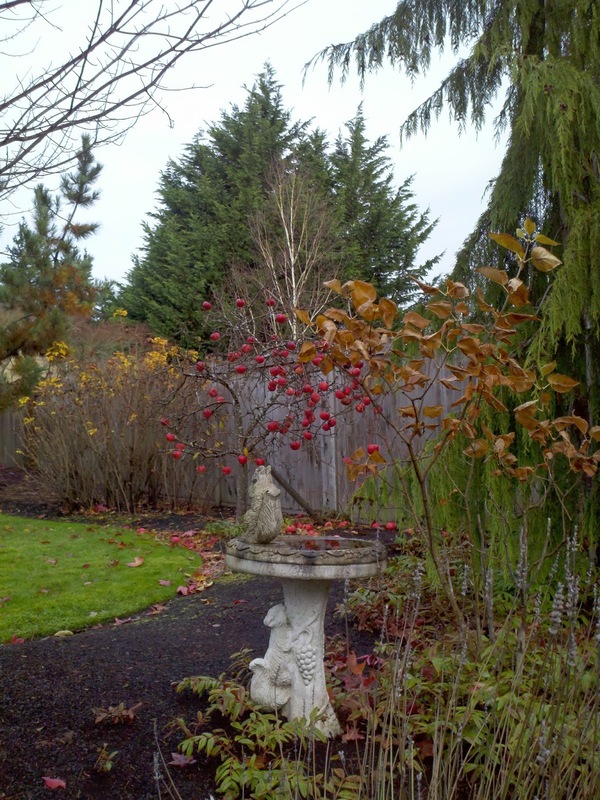 An apple tree in the background has apples but no leaves. Weather: we had a moment of sunshine today, otherwise I would describe the weather as blustery. Yesterday: Our church hosted an early Thanksgiving potluck. My married daughter invited her in-laws. It was fun to reconnect with Nancy and Rick! Football: The University of Oregon Ducks lost their football game to Stanford University last week. Yesterday the Ducks beat the University of Utah team that beat Stanford earlier in the season. Once that game was over all eyes shifted to the Stanford v USC game. If USC could beat Stanford then UO would get back in the driver's seat in the Pac-12 North. USC did it! They beat Stanford! It is the first time in my life that I have cheered for the USC Trojans. This past week: a substitute clerk was hired to replace my library clerk. It was a relief to finally have some help in the library. At one point she turned to me and commented on how tired she was, how surprisingly demanding the job is. It sure is, and I've been doing it alone for seven weeks. Some days I wasn't sure if I could make it out to the parking at the end of the day to drive home. I was just so tired. Also in the library: I have finally untangled the mess of circulation. We are still using a remote circulation system since the library system data still has not been recovered. It is really weird checking out books even though I can't look at the student accounts. I also got my Mock Printz team back to work after I had a chance to clean up my spreadsheet. I still have around 50 active students reading our Mock Printz titles. A few kids decided to stop, which is understandable since there has been so much confusion with the system being down for so long. Movies: My daughter, her friend Nancy, and I went and saw Despicable Me, 2 last Sunday. There was hardly anyone in the theater which I think made me think it wasn't as funny as the first one. But I did like it. Friday my husband and I went and saw Twelve Years a Slave. Every American should see this film. The whole institution of slavery was so abominable. We both wept. The thought of one person treating another the way that Masters treated their slaves is beyond comprehension. And many of these masters said that it was scriptural for men to have slaves and to mistreat them. Ah, so awful. From the kitchen: a lovely romaine salad with pears, dried cranberries, pecan pieces, feta cheese, and dressed with poppy seed dressing. I made it for the potluck and most of it wasn't eaten, so we had it for lunch today. The Golden Day by Ursala Dubosarsky...a short novel that has been getting quite a bit of attention as a Printz contender. And the Mountains Echoed by Khaled Hosseini...a book club selection, this is an audiobook. A Sense of an Ending by Julian Barnes...another book club selection, this one should give us tons to discuss. I'm just a Raggedy Anne in a Barbie Doll world! This is part of my ragdoll collection. 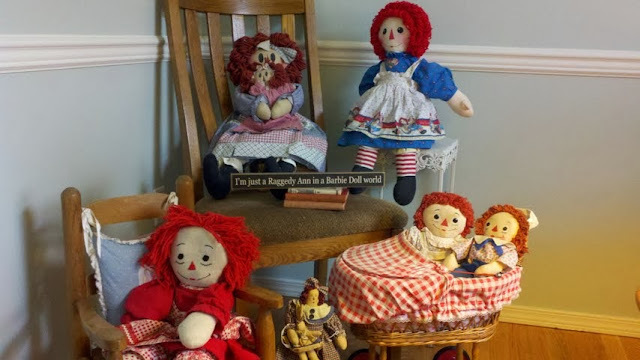 Since my name is Anne I've collected Raggedy Ann dolls since I was very young. I knew my husband was the right man for me when his mother gave me his Raggedy Andy doll he played with as a young child. His doll is a perfect match to my first doll, both shown in the carriage. My favorite is the doll in the rocking chair. She was handmade for me by my best friend. 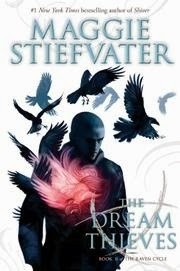 The Dream Thieves by Maggie Stiefvater is the 2nd book in the Raven Cycle (Raven Boys.) Don't even think about reading this book before reading The Raven Boys. There are too many characters and a lot of back-story in the first book necessary for understanding what is happening in this one. I listened to the audiobook which is narrated by Will Patton who has a very interesting, raspy voice. 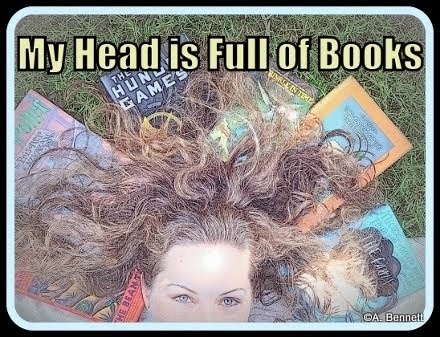 I wanted to devour the book whole, yet I also wanted to linger over it. I wanted to read fast so I could discover the answers to all my questions, yet I wanted to savor it at the same time. Stiefvater is one of my favorite YA authors right now. I haven't read anything by her that I haven't liked. In addition to her immense writing talents she is also an artist and a musician. In the YouTube clip below she is painting graffiti on a car, which plays into the storyline. In the background is the music that she wrote for The Dream Thieves. Suffice it to say, I am a huge fan. I can't wait for the third book in The Raven Cycle to come out. 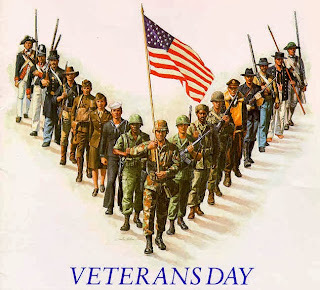 Veterans Day: 11-11. 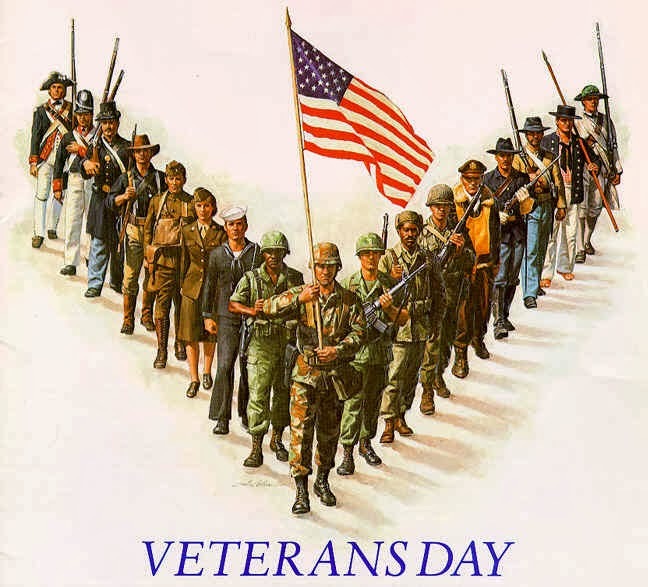 Thank you to all our Nation's Vets who have and are serving our country so honorably. My husband, an Iraqi War Vet, will be out of town tomorrow on a business trip to Colorado. Thank you for all you do, Don. The weather this past week: has been windy and wet. The skies seem to have turned permanently grey. Dishwasher: We finally went shopping for a a new dishwasher to replace the one that caused all the leakage that led to the need for the full floor repair. Football: The news is both good and bad. The University of Oregon Ducks lost their first game of the season to Stanford on Thursday night. Boo-hoo. But the Graham-Kapowsin High School Eagles won their first playoff game yesterday. Yea! They are on their way to more football and possibly a state title. Dreams: I think I've been reading too many paranormal books lately because my dreams are filled with magic, vampires, and scary things. Even the historical fiction book I just finished had a ghost in it. 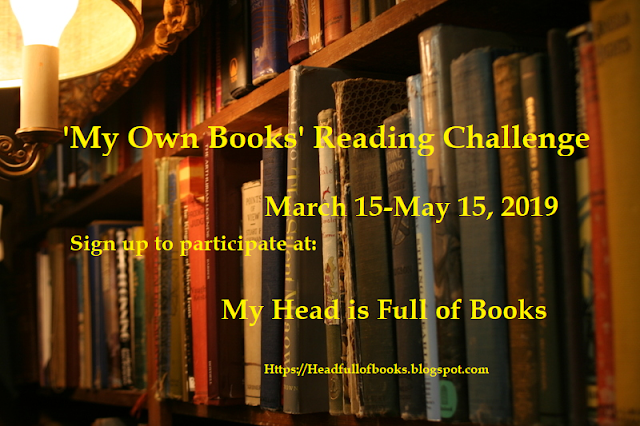 time for a strong dose of realistic fiction or, better yet, some nonfiction. 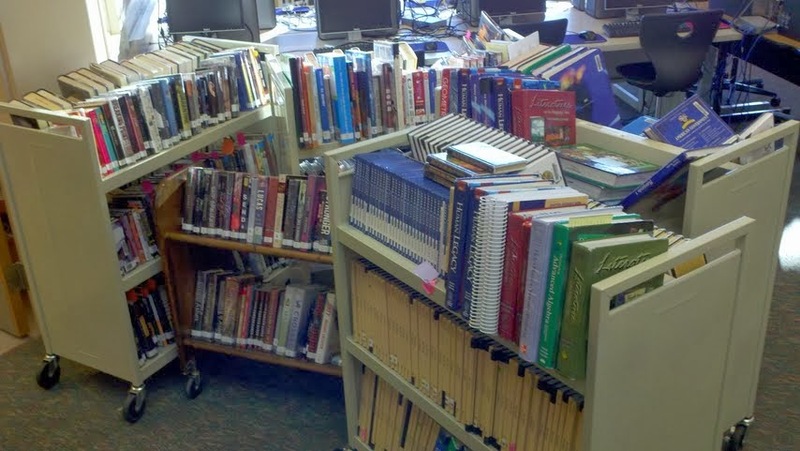 Library update: The OPAC system in the Bethel School District is still not functioning. We had a big meeting this past Tuesday with all the librarians and district big-wigs to explain the cause and how we are to proceed. Our system has been sent out to a Disaster Data Recovery organization so they are hopeful that we will have a full or nearly full data recovery. But they made no promises. In the meantime I have changed how I am checking in and out books which will allow me to quickly interface with the system once we are back up. One of my blogging friends reminded me that this problem is such a first-world issue. But since I don't have third world problems it feels like a disaster to me. On the good side of things, they have hired a substitute for my clerk who is still out ill. Finally I will have some help after being alone in the library for seven weeks! I'll be able to take a potty break without locking the library! The Dream Thieves by Maggie Stiefvater...my audiobook selection, a contributor to my paranormal dreams. The Sense of an Ending by Julian Barnes...a book club selection. In the Shadow of Blackbirds by Cat Winters. Set in SF in 1918 at the height of the flu epidemic and WWI. There were spiritualist and paranormal aspects to this book, too. And the Mountains Echoed by Khaled Hosseni. Another book club selection, the audiobook just arrived in the nick of time. Blogging issue: this blog is hosted by Blogger. One of the things I can do is look at the statistics of how many visits my pages have received and then that information is compiled into friendly charts. The only problem, the chart shows statistics from May 2007 to present. Oddly I didn't start blogging until July 2009. How can I have statistics for a period of time when I wasn't blogging? Blogger has been notified but there's been no reply. What's up with that? What's up with that? From the kitchen: Carly and a friend are home for the week-end which means lots of home cooked food. So far we've made Pumpkin Waffles for breakfast and Eggplant Parmesan for dinner. Snapshot Saturday is hosted by West Metro Mommy. For those you you who have followed my blog you will know that my district had a huge server problem and they are slowly rebuilding all the programs. The library OPAC systems is STILL out after nearly four weeks. At one point this is how many books that were piled up waiting to be checked in before they could be shelved. Since taking this picture I've done a different type of off-line circulation which allows me to shelf the books. I am keeping my fingers crossed that my "fix" works when the system comes back on-line. Needless to say this has been a very frustrating time for me at work! "When I think back on all the crap I learned in high school..."
Cue the music! Let it play as you read this blog post. Today as I was brushing my hair and readying myself for work as a school librarian, the song Kodachrome by Paul Simon ran through my head, particularly the first two lines (When I think back to all the crap I learned in high school, it is a wonder I can think at all.) All the way to work I reflected on what a "crappy" education I received in high school compared to what is expected of students today. My last math class was sophomore year where I sat in the back of the class totally lost, doodling. I took four years of French and can barely speak a sentence. 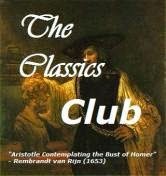 The only "classic" book I remember reading was The Great Gatsby, and I don't think I actually read it, just skimmed it. I took judo for PE one semester, which was pretty cool. And in another PE class we had archery lessons. Can you imagine that today? I didn't take US History, I took some current world problems class instead. In my Home Ec sewing class I made a blazer. It took me all semester to finish it. It was so ugly I never actually wore it. In the cooking portion of the class we learned to make cinnamon rolls from scratch. Yummy but not exactly a healthy life skill. I went to the school library ONCE and it wasn't to check out a book. I was in a student leadership class where we discussed important things like what we should do for the next assembly. I liked my Chemistry class but I was really bad at it since my math skills were so low. Sigh. I took pottery classes, as many as I could fit in. I don't think anything has survived from my 'pottery phase', however. Every day we had one period off to study or walk around the school. It is bizarre to think about that. I'm sure I should have used the time to improve my math skills but I just remember visiting with friends who had the same period off as me. I didn't smoke, but we had a smoking spot on campus where students could go when they needed a cigarette. Gasp! When I think back on all the crap I learned (or didn't learn) in high school, it IS a wonder I can think at all! When you feel like criticizing today's youth for something related to education, think back on your own high school experience and compare it to what we expect from kids today. I'm pretty sure I had more fun but learned much less. The Lord of Opium by Nancy Farmer is the sequel to the wildly popular The House of the Scorpion which was first published in 2002. It continues the story, after El Patron's death, of Matteo, his clone, who now ascends to be the drug lord of the kingdom of Opium. Good: The story picks up right after the ending of the first book with very little time spent rehashing the details of that book. Bad: I read HoS over ten years ago and I should have reread it before launching into LoO. I actually needed more rehashing than I got as I'd forgotten great swatches of the storyline. Good: We meet back up with beloved characters like Matteo, Maria, Celia. Bad: Similar to HoS in LoO there are LOTS of characters, so many that it is sometimes hard to keep track of them and many of the characters seem flat and one-dimensional. Maria, a favorite from HoS, makes only occasional appearances until she jumps through the wormhole. Once in Opium her presence doesn't really add anything to the storyline. Good: Matteo, as the new El Patron, has a lot to do and to worry about. Interesting questions of ethics arise as he considers how he wants to live his life and on what priorities he wants to focus. His commitment to freeing the eejits from mental enslavement is a worthy project and so is his interest in Waitress. Bad: Matteo is only fourteen. It is hard to believe that he would be prepared to step into the shoes of the old El Patron and manage a whole country with only the help of one man, Cienfuego, who is a thuggish but ultimately likable character. I also felt like there were too many things for me, the reader, to stay focused on. Matt was concerned about the eejits, the safety of Opium, the Space Station, the biosphere, a party for his friends, the Lost Boys, El Patron's voice in his head, etc. The list goes on. Jen over at Reads for Keeps made a diagram showing the things that Matt juggles which explains why it is difficult for the reader to stay focused. Hop on over to her review to take a look. Good: The end of the book contains lots of action and wraps things up nicely. Bad: The majority of the book contains little action. The pacing of most of the book is very slow (read: boring.) When Matt does encounter his first opportunity to be brave and to fight back he is knocked out and wakes up in a hospital. It reminded me of what would happen to Katniss during the periods of high-action in The Mockingjay. Everything wraps up so nice and neatly it made me wonder if Farmer was concerned at hurting reader's feelings if she killed off a beloved character or something. 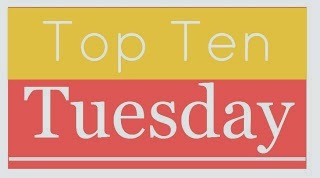 Point: HoS won three prestigious award: National Book Award, Newbery Honor, and Printz Honor. Since the Newbery Award is given out to more middle grade books and the Printz Award to more high school level books the fact that it won both tells me that the award committee thought it fell somewhere in between. With the slower pacing and the non-dramatic action I felt that LoO was more geared toward younger readers. I suspect that high school students will agree with me that the book is too slow and bit boring. Good: Farmer does a fabulous job with world-building. Everything she describes is so vivid and real. Audiobook: My husband and I listened to half of LoO in audiobook format. Raul Espanza was a perfect choice as reader as his Spanish words just rolled off his tongue. I would have struggled reading them for myself. At the halfway point my husband decided that he had enough and stopped listening. It was too slow for him. My evaluation: I was prepared to say that I didn't like the book for the above reasons. However, I didn't write my review immediately. As the days passed I realized that I kept thinking about the book, mostly about the world that Farmer created, and it came to me that this is a book and storyline that needs to percolate around in the mind to be fully appreciated. I also would recommend that you reread The House of the Scorpion before launching into The Lord of Opium to get the full benefit of the setting and the characters. Altogether I would give this book just an average rating, not good or bad. I would also recommend it for middle grade reader, 5th-8th grades, the action isn't exciting enough to hold the attention of older readers. Disclaimer: I checked out the audiobook from my public library. Ready to give the whole vampire paranormal romance genre the heave-ho? I'd wait a minute and read this book before you do. The Coldest Girl in Coldtown by Holly Black is like Twilight on steroids with strong writing, character development, and plotting. Coldtowns started springing up a few years ago when the equilibrium that had kept vampires in check went awry. When a vampire bites a human they become infected as with a horrible disease and all this person wants to do is to drink human blood. If they do they will die and return as a vampire. This new vampire then will seek out more blood and soon great swatches of society are being turned in to vampires.Communities with high vampirism rates were forced to build walled, secured cities to keep the rest of society safe from these vampires and from the newly bitten who were likely to turn. Once a person entered a Coldtown it was very unlikely that they would ever leave. So when Tana awakens one morning to find all of her partying friends dead except her x-boyfriend Aiden. She knows that they have to go to Coldtown to keep their families safe from what they will likely become since both of them have been bitten or scratched by vampires. In the process they meet up with an unassuming vampire, Gavriel, who wants to go to Coldtown with them. Aiden wants to drink human blood so he can become a vampire, Tana wants to go to safe room where she can sweat out the poison so she can return to her previous life. But everything isn't as it seems in Coldtown. Dangers confront them at every turn. This is a 2014 Mock Printz selection for the BSD. 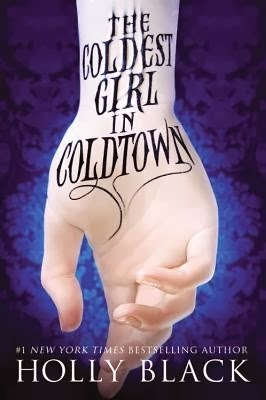 I listened to the audiobook version of The Coldest Girl in Coldtown checked out from the public library. Christine Lakin did an excellent job as the reader of this exciting book and I recommend it in this format. Weather: Cold and rainy. Yesterday we had a wind storm that shook most of the remaining leaves off the trees. Our neighbors a few blocks away lost power for a few hours. It is November for sure! Yesterday: Our church hosted a Fair Trade, Global market selling products from organizations that support sustainable products or items made by artisans worldwide who can make a living. A few of the organizations we partnered with: L'Arche Community taking orders to Christmas wreaths and selling plants from their greenhouse; Church of the Indian Fellowship selling jewelry that they make in their traditional methods; Beads for Life-paper beads made into necklaces, earrings, and bracelets; SERRV-all kinds of products; Fair Trade Winds-a store in Seattle that sells many of these products and made a nice display for us, and Equal Exchange coffee, tea and chocolate. That didn't go as planned: The women's group served soup and pie for a $5 donation at the market. After expenses and the cost of getting a food service permit, I think we made $15. Ha! 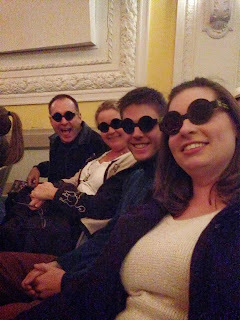 Last evening: We went to see Potted Potter, a play in 70 minutes which sums up all seven of the Harry Potter books. Done by two actors, this has been very popular in England for the past several years and finally made it to Tacoma. It was quite funny. 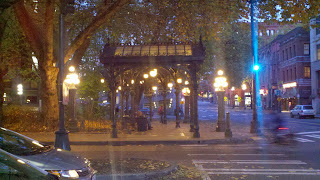 Friday evening: I took the Sounder train up to Seattle to meet up with Don for dinner. He had a meeting in Seattle earlier in the day so we thought we would have dinner in the city before attending our daughter's first Seattle University Choir concert of the new school year. 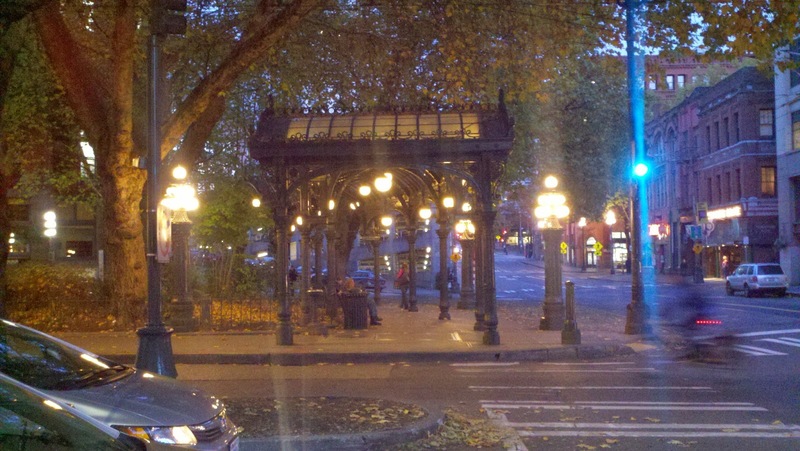 We wanted to dine in the Pioneer Square area of town but didn't do our homework and weren't able to find a restaurant that looked like what we wanted so we ended up going back toward SU and found a sports bar that fit the bill. The concert was wonderful as usual. Afterwards we brought Carly home with us for the week-end. School: My school district still has partial server outage so my library OPAC system is still down, counting week-ends that makes 19 days without the ability to check-in any books, or look at any student accounts. It is madness! Argh! 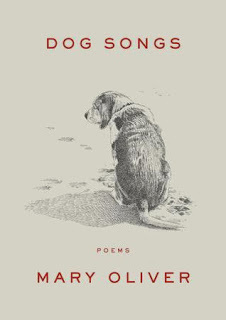 Dog Songs, poems by Mary Oliver is now a favorite poetry book. I've always loved Mary Oliver's poems because I can actually read and understand them. These poems are all about the dogs in her life. I could relate. 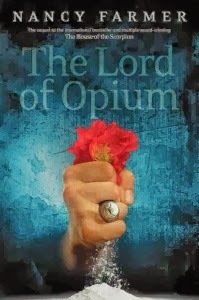 The Lord of Opium by Nancy Farmer. This is the sequel to The House of the Scorpion which was written ten years ago. It is simmering well in my mind. At first I didn't think I cared for it but as the week as progressed I keep thinking about it and decided that I like it better after giving it time to percolate. Look for my review soon. The Dream Thieves by Maggie Stiefvater. This is my current audiobook selection. The second book in the Raven Cycle series (Raven Boys). This is like candy I love listening to it so much. The Sense of an Ending by Julian Barnes. This is the book club selection this month. In the Shadow of Blackbirds by Cat Winters. I am still struggling with this book though I have a made a bit of progress this week. Prayers for friends who are either recovering from a disease/surgery or need a diagnosis for some unknown illness: Sharon, Marty, Phillis, Ed, Twila. Today's scripture: John 15:17-"This is my command, love one another." From the kitchen: Beef Stew, cornbread, carrot/apple salad, and pumpkin cream cake made special for son-in-law's birthday dinner. He said he had his taste buds ready for the stew all day! Bless his heart. 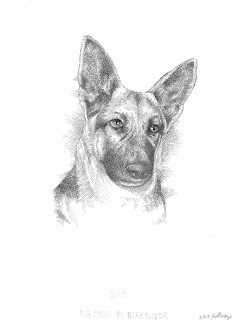 Dog Songs Poems by Mary Oliver is a lovely collection of 35 poems and one essay all about dogs. I can't even tell you how exquisite this collection is. I'm afraid you will just have to read it for yourself and find out. First I thought I'd just read one or two poems while I worked away at my job as a librarian. Soon I was sitting and reading the whole thing with big, fat tears rolling down my cheeks (yes, right in front of the students and everybody) because I, like Mary Oliver, understand what it means to be loved by a dog. And many most all of the poems are spot-on and speak to that special place we reserve within us that has to do with the love we feel toward our pets. He doesn't even understand it. I know what I will give as my Christmas gift this year to all my dog-loving family members...Dog Songs, Poems by Mary Oliver. Disclaimer: I read the copy of the book I purchased for my library.